Wow Tracy, welcome to "Less is More". This is fabulous, what a wonderful beginning to entering challenges... I'm so pleased you chose ours! Thanks so much and we hope top see you each week from now onwards! If you could possibly remove the Word Verification option form your blog it would make commenting much easier for us. Thanks so much. Hi there ! Four boys you say goodness me it's a wonder you have time for anything ! Fabulous card and you have chosen a great challenge site for your first entry. Your card is gorgeous very stylish indeed, look forward to seeing more of your work. Welcome to the addiction that is LIM!! Fabby card - love it! 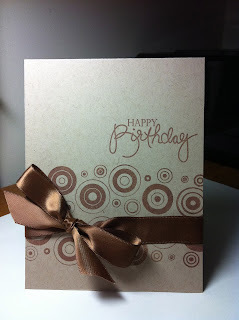 FAb card, love the cardstock as well. Great card...love,love,love that yummy chocolate bow! Touched you chose ours to be the first you ever entered...thank you! wow-love this card and that lush ribbon. Very nice card! I like the simple use of one colour! Very beautiful and elegant card, perfect choice of colors! It looks so natural.